It is easy to take for granted an ordinary day strolling across the beautiful landscaped grounds of the U.S. Capitol. Chirping birds, chittering squirrels, humming lawnmowers and the excited voices of children on their first visit to Washington, D.C., make up the soundtrack of the Capitol campus. In between, there might be a muffled clanking of a hammer or the scratching of a stone mason hard at work preserving the area so it can continue to inspire generations to come. What I love most about Capitol Hill is that its vibrancy is infectious. There is always something happening here. Shuttles whizzing up the Hill ferrying visitors; rallies for or against various causes; members rushing to vote; staff shuffling papers and binders; and projects — lots of projects. Methodically inspecting an AOC vehicle. Construction projects on the Capitol campus are as constant as the ringing of the bells that summon lawmakers to the chambers for votes. And with projects come contractors making deliveries. Last spring, a truck approached a security checkpoint with a load of lumber. The contractor exited the truck to present paperwork to police officers manning the screening area. While inside, the brakes on the vehicle failed. The truck, driverless, drifted down the hill and smashed into the Summerhouse. This would be no ordinary day. Minutes after the accident, Lee Dennis, Facilities Operations supervisor with Capitol Grounds and Arboretum, arrived at the Summerhouse to help. "I was standing next to the Summerhouse looking at the truck when 20 toddlers holding a rope walked past me. I started to shake when I realized that they would have never heard the contractor’s drifting truck and likely would have been hit had they passed by minutes earlier." Stevan Boozer (left) and Lee Dennis (right) check the paperwork on a recently inspected vehicle. Dennis, who knew that the Architect of the Capitol (AOC) had a couple of vehicles with braking systems similar to those of the contractor, immediately recalled those trucks for reinspection. In the process, he coordinated with the Property Management Branch to ground vehicles that did not pass inspection. "We were really committed to getting the AOC fleet program in better shape," said Percell Artis Jr. the property management supervisor in the Acquisition and Material Management Division (AMMD). "Capitol Grounds, with their on-site mechanics, was a great partner," he said. 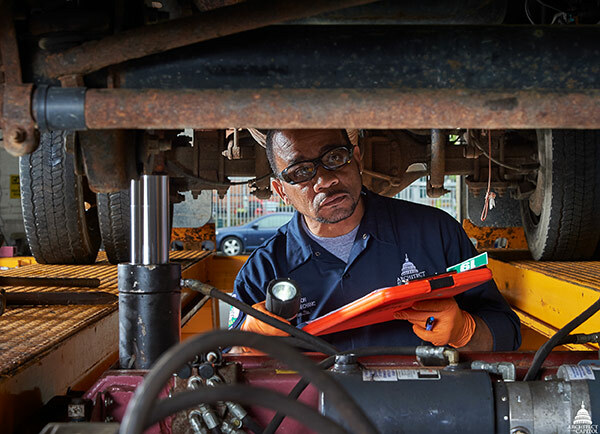 Henry Makwakwa, AMMD fleet manager, worked on adding verbiage to the fleet manual that provided clearer guidelines for annual inspections. "We instituted an inspection period from April through July. Including the language in our manual helps us hold property officers across the agency accountable. We want all of our vehicles to be safe and roadworthy," said Makwakwa. A member of Capitol Grounds and Arboretum inspects an AOC vehicle. With the Property Management Branch's support, Dennis leveraged the Summerhouse experience to implement a management tool to track vehicles owned and operated by the agency. The team inspected, stickered and now tracks all vehicles from dump trucks to a tiny one-seater cart. Vehicles identified as "in need of inspections" are shared at executive staff meetings. "From top to bottom, the AOC team supported our efforts to ensure the safety of the vehicles we operate on campus. The tracker is a tool to encourage responsibility for our assets, both human and mechanical," said Jim Kaufmann, director of Capitol Grounds and Arboretum. In a two-month period, the entire fleet was inspected and certified safe to operate. 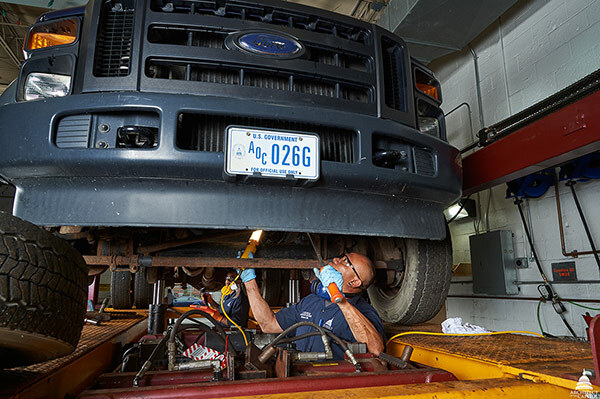 Indeed, with rapidly climbing visitor rates — 5 million visitors were welcomed to the Capitol campus in Fiscal Year 2018 — supporting and operating well-maintained vehicles is even more urgent. "There are so many people walking around our workplace, and the degree of difficulty to traverse campus has become much more challenging, making good brakes, safety lights and mirrors a must. I want to know that I have done everything I can do to make AOC, and the people who visit the nation’s capital, safe." said Dennis. Carefully checking the undercarriage of an AOC vehicle. Even with the success of the fleet tracker, Dennis is convinced that he and his team can do better. He wanted the inspection process to be more proactive, so now he is working with Andrew Glendening, management and program analyst in Safety, Fire and Environmental Programs on a computer-aided facility management system that will provide automated alerts to vehicle owners or custodial managers when it’s time to get a vehicle inspected. 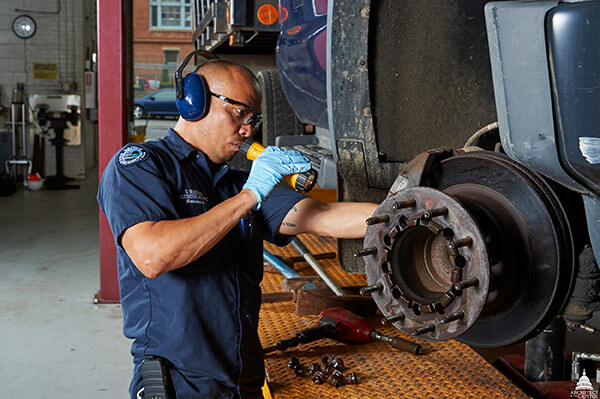 "At the start of this process, I was surprised at the condition of one of our trailers and thought to myself, 'I've given away better stuff,' but now I am proud of the progress we've made in vehicle maintenance. To me, safety is non-negotiable." And we can all agree that an ordinary day is the best kind of day.